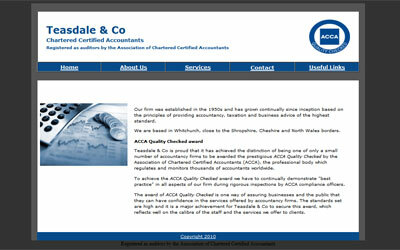 Teasdale & Co Chartered Certified Accountants is a Whitchurch accountancy firm serving all sizes of business, from sole traders to corporations in Cheshire, Shropshire and North East Wales. In 2014 we were asked to build a new version of their website, which was about five years old and designed for small screen sizes, meaning it looked lost on today’s bigger monitors. Also it was quite cluttered and the small type and unnecessary text made it very difficult to read. This, along with the use of generic images, gave the impression that the company was not approachable. This was our third accountancy website and once again we were keen to avoid the usual clichés of calculators and pens found on accountancy websites everywhere! We started with the content of the site, completely re-writing all the text and bring it away from the ‘corporate’ look. We wanted to make sure that when potential customer views the new site, they will find when they need to know more quickly, and be motivated to contact the company. The new website is built in mobile responsive design, making it easy to use across all devices, and we used modern typography and lots of white space to make it easier to read. We also took photos of the staff in their office for the personal touch that was needed and used their colours for the design. In common with all our sites, we added a contact form and ‘click to call’ phone numbers for mobile users. Teasdale Accountants moved to another provider in 2018 and we have no conection with their current website.